Udom Emmanuel, the executive Governor of Akwa Ibom State, is finally set to host Akwa United. This is following their winning of the 2017 AITEO Cup at the expense of Niger Tornadoes who they defeated on penalties putting to rest an almost one year wait. The Akwa Ibom State Governor will be hosting the entire team both players ,technical crew and backroom staff by 5pm on Wednesday 12th September 2018 at the Akwa Ibom State Government House. 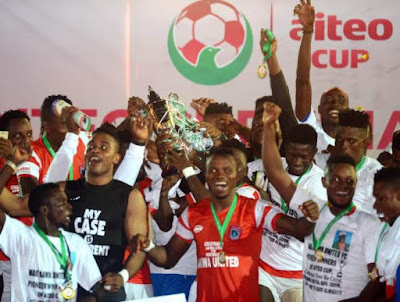 Akwa United who won there second AITEO FA Cup in four years had Olorunleke Ojo to thank for his three penalties saves that won the trophy for the Promise Keepers. Could it be cash, land, cars or buildings given as a reward from the state to the entire team. The players and staff are all eagerly waiting to see what the executive governor will dole out to them for their achievement in the 2017 AITEO Cup.